If you’ve spent much time reading about robots (or even just CGI), you’ve probably heard of the Uncanny Valley, the usual name applied to the weird disconnect we feel when we look at something that’s almost, but not quite human. Today, two occupants of that plot of conceptual real estate collided with each other in spectacular fashion, when half-man, half-bellowing bag of wind Piers Morgan unsuccessfully attempted to hit on a robot. 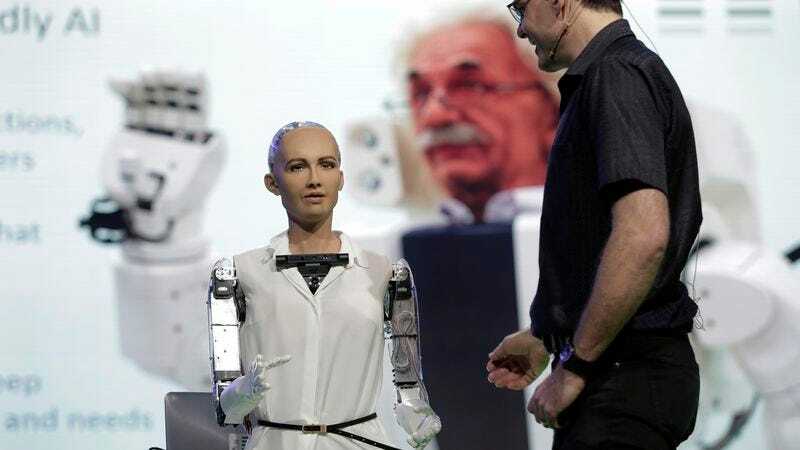 Designed by Hanson Robotics as a “social robot,” the device known as Sofia can (awkwardly) chat with people about various topics, while simultaneously creeping them out with her almost-human face. Sofia recently showed off her conversational skills on Morgan’s morning news show, Good Morning Britain, and the results were pretty weird on both sides.